Pack up your troubles. 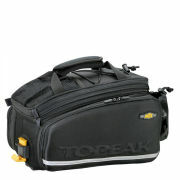 Large capacity road TrunkBag bike bag, perfect for commuting, errands or a range of other activities. Made with rigid foam that insulates and holds shape. Also features a large main compartment plus two zippered side compartments that zip open into full panniers and an expandable multi functional top pocket. 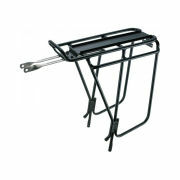 Aerodynamic shape is ideal for road and fitness bikes. 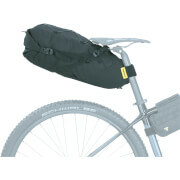 Expanding capacity main compartment with two side zippered panniers and a multifunctional, expanding top pocket. 600 Denier Polyester with Dupont Teflon coating. 3M reflective strip, built-in carrying handle and shoulder strap. With a QuickTrack mount for compatibility with Beam Rack RX. Dimensions: 31 x 20.5 x 16-25cm. Weight: 750g (PBK Office scales). This is a great product. I've had one over 10 years, two bikes, trans continental, and thousands of miles. Still a champ. Did some zipper work but that's it. Fabric is getting thin. Buying another for a Europe adventure. Wish it had a locking device. Worth every penny. If I had seen one before placing the order, I would have ordered a larger size. Apart from being smaller than I expected, I find it is a very well made bag and attaches neatly to the Topeak rack that I purchased on the same order. The idea of having panniers that can be rolled up and stored in the side zippered compartments make this bag very versatile. I have run these through good and bad weather for over two years now on my daily 15km each way commute. They have ripped apart at the seams of the panniers. I expected better from this brand especially when the panniers are used rarely and only for simple stuff like a laptop or some clothes or some groceries here and there. Having said all that, the top bag is a great size and used daily and is very sturdy. I am replacing my ripped up one with a new one but it's such a shame to do so given the rest of the unit, apart from the panniers, is still in perfect condition. purchased the rack and this bag. Installed it in less than 10 mins. Excellent construction and quality of material. Side panniers tucks in into a small bag when not in use. I sprayed the bag with 3m scotchguard to protect from dirt and light rain. I can put everything I need when I go to work, plus the side panniers can be used for some groceries on the way home..
cons : these are really nice and unique racks/bag.. It so attractive that I'm not comfortable leaving it outside the store.